Your blog is a wealth of fascinating information. 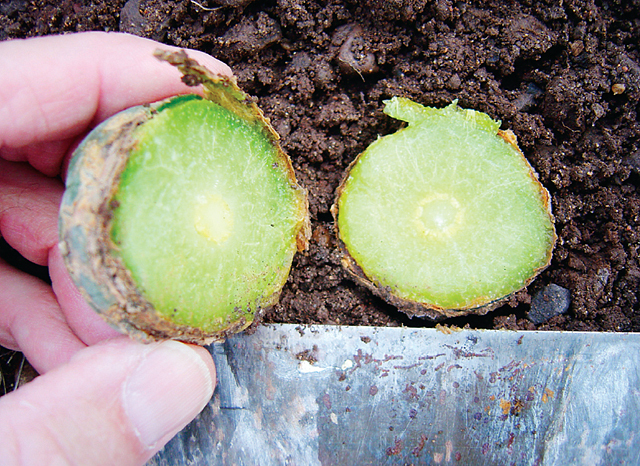 Could lophophora harvested in this way be replanted if the cut scabs over? Or must it be grafted to continue growth? On the subject of grafting: What is the minimum size seedling one could graft to a San Pedro cactus? Does the button have to be a certain size for it to regrow? Even small buttons will set new roots. 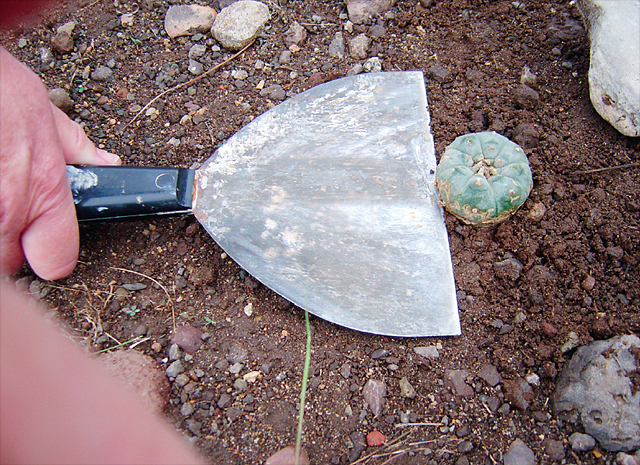 I had to decapitate a 6.5 mm (~0.25'') wide Lophophora williamsii (Sierra de la Paila, Coahuila; VM 305k) seedling because its root started to rot. I let the cutting callus, placed it on soil, and shortly after two adventitious roots formed. 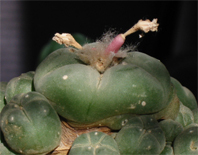 I can’t attach photos to comments so instead I’ve posted a picture of the seedling at the Lophophora Google group. The plant is rather shriveled but I’m pretty certain it will survive. I couldn't find anything about the yellowing of lophophora. I have one that is about tennis ball size with one baby that is begining to turn a little yellow colored near the base of it. Do you know what this could be? My first crop of seedlings has had a tough life. Many turned a red-brownish while many of the healthy one's perished from an attack of fungus fly larvae. I grafted a few of these poor guys to recently rooted san pedro cuttings. The grafts seem to have taken, but they don't seem to be growing. Does anyone believe they have a chance? Or should I cut them off and start over? Last season my lophophora had five flowers. The first ones self-pollinated and had about five seeds. Later, as I only had one plant I decided to do a bit of pollinating myself. I cut off a pollen stem with a fine tweezers and rubbed the pollen all over the tops. Brushing didn’t work well. The next lot of seeds was much larger, about 15 seeds. From this experience I suggest trying the above action. A friend who has a lot of experience told me that if you pollinate two unrelated plants you should get at least 25 seeds and a much larger percentage will germinate. This winter I managed to purchase some unrelated already grafted plants. I’m hoping they will flower and I’ll be able to cross them for more seeds. Of the self-pollinated seeds I got about a 20% germination rate. I just sowed 15 more of these seeds and I’ll check the result. I have a question. When I cut the grafting stock I noticed the growth ring was large. I thought I could try to put more than one seedling on that ring. Did anyone try this? Any reason not to do this? 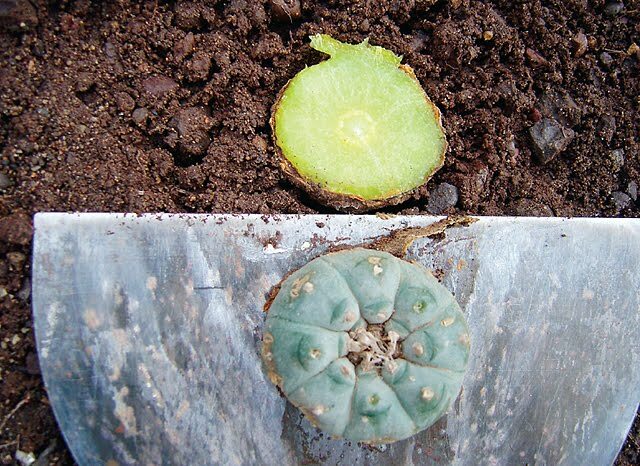 1) Regarding the yellowing of Lophophora, generally cactus will yellow for the same reasons as other plants, i.e. it could be nitrogen deficiency, some sort of root problem, or the light conditions being wrong. It could also be a sign of aging – old epidermis can turn yellowish brown before bark is formed. If you have a photo of the plant you can post it at http://groups.google.com/group/lophophora. 2) Regarding the grafted seedlings, if the vascular bundles are properly aligned and the grafts have taken, I would give them a chance. If the stock is in active growth and the scion still shows no sign of growing after a month or two, or if the scion starts to shrivel, I would consider de-grafting. 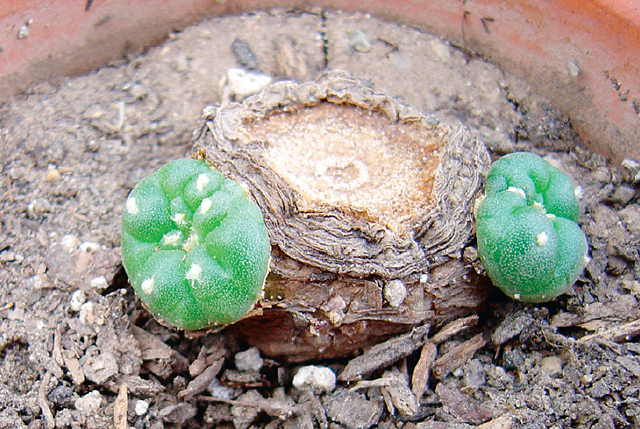 3) Mani, thanks for sharing your pollination experiments – my results with self-pollinated seeds haven’t been too convincing either (check the "Full circle" section at http://lophophora.blogspot.com/2006/04/power-of-grafting-ix-full-circle.html). Regarding your question, I have grafted more than one seedling on the wide vascular ring of a single, large stock plant. The only disadvantages I can think of is that the grafts might grow short of space if they all take (in my case only one graft took), and the growth of the individual scions might be stunted compared to having only one scion. But this can easily be solved later by de-grafting extraneous scions. What are the most agreed upon recommendations for the the best growing medium for all the lophophora? Any suggestions would be appreciated. I won't claim it's the most agreed upon growing medium for Lophophora (there are probably as many answers to your question as there are people growing lophs ;-) but I'm normally using a mix consisting of equal parts, by volume, of limestone gravel, loamy sand, and regular soil (maybe a tad heavier on the limestone). Lophophora share habitat with Ariocarpus so most of the growing instructions from the Living Rocks of Mexico site can be applied directly - the site also explains why, contrary to a common misconception, limestone soils are not highly alkaline. Will crushed sea shells do as well as limestone chips? Also, what is "loamy" sand? Just course sand? And by regular soil, do you mean some kind of peat? Do you propagate the seed and grow in the same mixture. I have been using a mixture of coconut coir treated with kelp and fish meal, dolomite, pumice and crushed sea shell. This seems to work well, but most of the seedlings have turned brown. I think the fluorescent light was too intense? And perhaps I stopped misting them too soon. I am now going with the plastic bag technique but am worried they might get too much water and not enough light. I guess seashells are fine (like limestone they have a high content of calcium carbonate), but I've never tried using it. By loamy sand, I mean coarse sand containing some silt and clay; and by regular soil, I mean whatever brand of commercial potting soil available (it will probably be based on sifted peat ;-). I propagate seeds and grow mature plants in the same soil mix. Originally I used a finer mix (without the limestone gravel) for seedlings, but found they did well when sown directly in the coarse limestone mix. Regarding the plastic bag technique, I've kept seedlings in the humid environment of a bag for up to a year without problems, and only experienced rot in a few batches of seedlings (the soil must not be soaking wet). I have two seedlings, both are turning brown. Only thing I could think of as the problem is too much water. Any ideas? Hmmm, too much water would probably result in the plants loosing their roots and/or rotting. Are they turning reddish brown? That could be a reaction to too much light. Alternatively the coloration might be pest related (you can check this page for a list of cacti related problems). How old (or how big) the peyote must be to cut the button ? Buttons should be mature (old enough to flower) and stressed for a few years before harvest. when should I expect from the lopho to flower. I also sen a few pics. I replanted it and I wanted you to tell me your opinion cause its my first one. I hope it looks healthy. peace! Please refer to the reply to your question posted at the Lophophora Group. If you cut your plants leave the root in the soil to callus - it might be prudent to keep the plant dry before cutting and leave it dry until it has formed a callus. You might also want to consider the risk for the cut plant not to grow back. Danny, if the damage has healed and there is no sign of rot then I would let the plants outgrow the damage. If there are signs of rot, then I would either remove the affected part or completely cut the plant, depending on to what extent the rot has spread. "growing cacti from seed" page - but using a propagator is probably even better :-) I usually let the seedlings grow in a quite damp (not soaked) environment for the first few months before I start hardening them off. I am about to harvest my lophophora plants for the first time and had a quick question if you may. So after i cut the crowns at ground level, do i water the cactus regularly? As if it wasnt harvested? Do i change watering habits and etc? Thank you so much. I planted seeds back in 98 I decided to repot. I noticed how they developed over the years.Out of the plants potted I noticed the differences in soil composition.Out of all the combinations, the best which I saw was, 1 Potting soil-2 sand - 1 peat moss -1 crushed lime(Lime flakes).My latest endeavor now is to use 1 peat moss 2 sand 5mm,1 lime flakes,1 worm castings.Reason being, I try to get away from bits and pieces of wood in soil. my plants took about 7-8 years to flower.I harvested the seeds over the last 3 years and finally got around to planting them as I plan to do some grafting.They germinated very well.I used my typical 1 peat 1 soil 2 sand and 1 lime, except I used some powdered lime instead.I thought that this may have been a mistake but they seem to be doing quite well along with a couple of other yearlings as test plants along with them.They receive indirect sunlight in a plastic container with lid.They are kept moist.When one mentions browning of seedlings I wonder if they are turning reddish due to too much direct sunlight.The seedlings get sunburnt in a matter of a few hours.I can't see lights burning them though I guess it all depends on what kind of light you use but flourescent light I doubt it.I am surprised how well the plants grow with a northern exposure,where they get a bit of morning light and evening light.Naturally I prefer the southern exposure for them, more squat in direct southern light exposure as opposed to elongated in some situations, depending upon how close together they are and how deep in the pot that they were planted. By the way all my seeds came from Cactus Heaven located in Malta,check it out sometime as they list hundreds of various cactus seeds. Paul, it's good hearing about your experiences in growing these wonderful plants. If you have any pictures of your collection that you are willing to share you can post them at the Lophophora Google Group. Anonymous asked how to treat peyote plants after harvesting. I would let the wound callus before resuming watering and then water the plant sparingly until it shows signs of new growth, and only then resume my normal water regiment. a couple of things, when I transplanted.I lost a plant as the root tip had broken off and was not given time to heal.One of the vascular tubes turned brown and went all the way up into the crown, which then turned to rot.I noticed other plants that I had placed a little too deep into the soil.This caused softening of the base of the plant due to, too much water around a sensitive area.I caught it in time,but I now clear the excessive soil away even if I have some root exposed. How well this works time will tell. As far as my soil mixes go I am still leary, a lot depends on how often you water. My idea about using a soil composition of 1 potting soil, 2 sand, 1 peat moss, 1 lime flakes, may be a little off, beacause i used a potting soil from the store which contains a varied amount of peat ect., which I screened to get out the wood chips etc. I used worm castings instead for the soil which would make it far richer, so i have to consider this fact and watch closely for water saturation.I use barbecue skewers to check the moisture content.Just stick them in the soil and check periodically. I am trying the mix of coconut and perlite, 1/1 and have found it to be really good for moisture retention, but not wet wet.I also have it mixed with soil and sand etc. at various ratios,4 coir to 1(1PS-2S-1PM-1L)etc. I have lost several plants due to damaged roots too, so nowadays transplanting is a multiday experience for me ;-) If I have the time I remove the plants from their pots and free them from the old soil some days in advance of repotting them in bone dry soil. I'm with you that soil mixes are an ongoing learning experience - my own recipe is a continuous work in progress influenced by earlier results combined with input from friends, articles, etc - the constant being that the soil is well-draining and relatively quick-drying. Regarding cameras, I personally prefer Nikon SLRs. I went seriously digital with the D70 and is currently using a Nikon D90 (I'm still using the D70 for time-lapse photography though). it has shrivaled up severely!!!! what can i do to save it???? Ben, I don't think there's anything you can do but place the plant in a shaded location and give it a drink of water. Are we talking a scorched epidermis or is the plant "just" dehydrated by the sun and heat? I'm so glad you linked this at the top of your site! Thanks! How long does it take for a cut button to grow new roots? I have may small buttons and am going to graft 3 of them to other cacti that I have I have 2 peruvian torches and one blue mertle, do you know if the one grafted to the blue mertle will still contain mescaline once it grows? i just received 4 peyote plants in the mail two days ago.. and planning on havesting them..
after they are replanted how long after replanting can i havest them? ( they are 11 year old regrown tops and one 5 year old plant . and two are they too young for potentcy ? That definitely looks like a budding offshoot. Good luck with your plant.